1. Here’s another recommendation from my son. The New Basement Tapes – “Lost on the River.” This is a series of unpublished poems written by Bob Dylan and set to music by a collection of talented musicians assembled by T. Bone Burnett: Elvis Costello, Rhiannon Giddens, Taylor Goldsmith, Jim James and Marcus Mumford. Each musician takes the lead on one of the songs that they were involved in; so you can pick out the musicians by their style and voice. The entire album is pretty amazing in my opinion. 2. 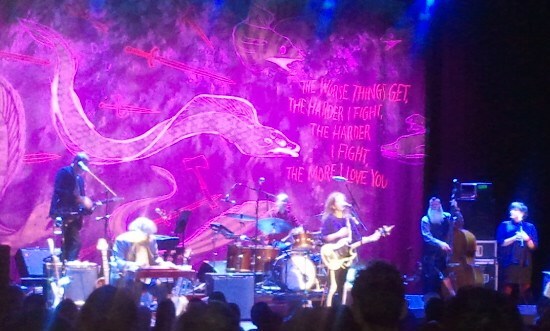 I attended a Neko Case concert at the Civic Theatre in New Orleans on Jan 27, 2014. I’d never heard of Neko Case, but my son thought I’d like her and so we went to the concert together. Well, I loved Neko Case. She mainly played songs from her new album, “The Worse Things Get, The Harder I Fight, The Harder I Fight, The More I Love You”. The album was nominated for a Grammy in “Best Alternative Album” category. Incidentally, the Grammy’s were held the previous night; alas, Neko Case didn’t win; but the nomination attests to the quality of the album. So we were in for a treat. The Civic Theater in New Orleans is an old movie theater that has been renovated for concerts and painted white, with seats removed from the downstairs area and drinks served. The sloping floor helped make for good viewing where ever you stood; however standing for a couple of hours really isn’t my cup of tea. The balcony still has seats. The bar type-atmosphere also lent itself to constant conversations and it was hard to hear–the speakers didn’t help. Hence, I listened to the concert just guessing at the lyrics, but listened to the album on the hour drive home. Neko Case’s voice is incredible–kind of country sounding. My son and I both agreed that this was a really tight concert, with her musicians playing multiple instruments and multiple sounds–all honed together. There are few repetitious sounds in her songs, lots of layers in the music from her voice, instruments, percussion and back-up singers. You won’t get bored with this album. Watching the other musicians play their parts (mostly from memory) helped me appreciate the songs when I listened to the album on the way home. Neko Case is obviously a very creative person–Wikipedia states she is a fine art’s major from a Canadian school. Her artwork and lyrics show that creativity; the lyrics had themes but again not much repetition. It seems that much of the lyrics were related to her personal journey over the past several years, including loss of loved ones, depression and then hope. One song, “Nearly Midnight, Honolulu”, Neko Case and her back-up singer played a-capella; the entire audience stopped-you could hear a pin drop. When I’m cooking I like to listen to music with lots of sounds and moods, I’m not particularly listening to every word; so this album is perfect. I highly recommend adding it to your music collection; and If Neko Case comes your way for a concert–you’ll be in for a treat, too.